KOMPSAT-5 successfully operated for its mission lifetime of 5 years and will continue its mission! KOMPSAT-5 is a SAR satellite which provides an all-weather, day-and-night supply of images of Earth’s surface. We are sharing a KOMPSAT-5 image over Attapeu in Laos taken on August 17th, 2018 when flooding happened due to dam collapse. The image shows flooded area in dark tone. The dam collapse caused flash flooding which swept away homes. KOMPSAT-5 were able to acquire this image in spite of the bad weather over the area. 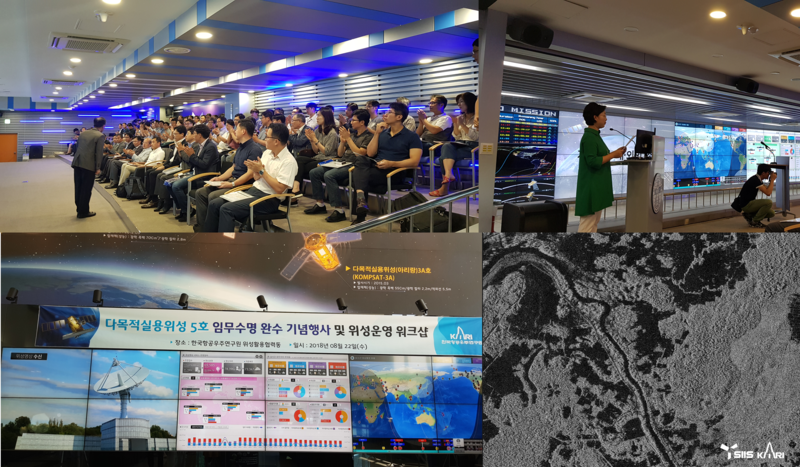 On celebration of KOMPSAT-5’s successful operation for its mission lifetime, KARI(Korea Aerospace Research Institute) held a workshop on August 22nd. People gathered in this workshop to celebrate KOMPSAT-5’s successful operation.